We offer FUNdraising programs for schools, churches, groups and even individuals. Tell us about your cause, and together we'll design an event that fits. Auctions! 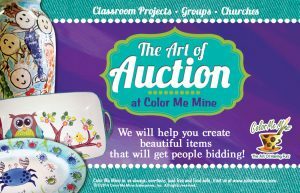 We can help you create an awesome hand painted work of art for your auction! 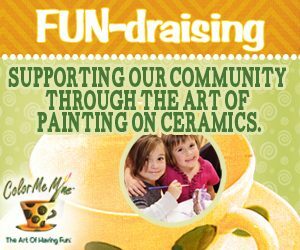 School & non-profitable organizations auctions can benefit tremendously by having your classroom or members create a personalized ceramic piece together. We will help you all the way through and even do the custom work for you. The ideas are endless! Tile Walls! Do you know what that is? 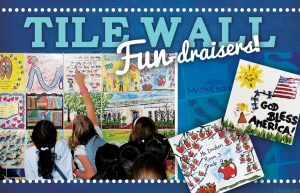 Whether it's for a big space, or a small space, we'll help you create a beautiful tile wall commemoration, and raise money at the same time! Your organization or school paint tiles for profit and at the end you will have this beautiful, personalized, tile wall created by you & your organization at your location. Paint For Profit! Any cause, any group or individual... we'll set aside a day and time when you'll send your group to us to paint. We'll donate $5 per painter to your cause. That's it.. it's that easy!